When Chinmay Malaviya graduated with a degree in computer engineering three years ago, he could easily have nabbed a job in the IT department of a big international bank. But unlike most of his classmates who did just that, he set out to find his place in the world. What he wanted to do and how he was going to get there, he had no clue. Several months of floundering ensued. While his classmates were posting pictures of nice holidays abroad, he could not nail down a good job and had to borrow money from his brother to make rent. 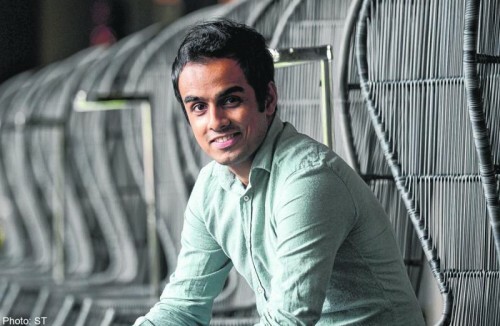 Then start-up Food Panda - a food delivery service - offered him a job. "My title was head of operations, but there was just one person in operations - me," he says. Although he knew nothing of the business, he was expected to build it up. And he did. Fuelled not by technical expertise but street smarts and a ravenous hunger to succeed, he hired staff, set in place a system and worked on marketing and branding. He grew Food Panda's client list from 20 to more than 350 in three years, and increased orders from 20 to several thousand a day. Today, out of its 40 outfits worldwide, Food Panda Singapore is the No. 2 best performer behind Russia. Last year, when he was just 23 years old, Mr Malaviya was made managing director. Today, his name card says chief executive officer and co-founder. Besides Singapore, he also runs Food Panda in Hong Kong. "At one time, I couldn't pay rent. Now I stay in five-star hotels when I travel on business trips. It feels pretty cool," he says, sounding chuffed. Earnest, with the rapid-fire speech patterns of an impatient go-getter, Mr Malaviya was born in New Delhi, the elder of two sons. "My parents are engineers, I come from a country full of engineers," he says. "I went to a good school, got good grades and was expected to go to a top university, become an engineer, get married at 25 and have kids." It was not how he wanted his life to pan out. "That would have killed me from the inside. I wanted to do something out of the box." The only way to do that, he decided, was to leave the country. So even though he got accepted by the prestigious Indian Institute of Technology in New Delhi, he also applied for several scholarships abroad and settled for one from Nanyang Technological University. "It was a full scholarship, with no financial burden on my parents," he says. "I wanted to study something different like political science but was not brave enough to do it." He took up computer engineering instead. Singapore - which he had visited once when he was seven - was a life-changer. While on two student exchanges, one to the United States and the other to France, he took the opportunity to travel. He came from a fairly cloistered background, and those sojourns really opened up his mind. He recalls his couchsurfing host in Milan. "He came to pick me up in a really fancy car, took me to his nice apartment, and showed me my room and said I could use his iPad. He had travelled a lot and was learning how to speak Mandarin from the Internet." One day, his host asked Mr Malaviya to drop by his shop. "He said it was just a five-minute walk from the apartment. I went, walked round and round but couldn't find it. So I called him and he came to fetch me from the apartment... and went to this tiny grocery store, not the big office I was expecting." The experience lobbed all his pre-conceived notions out the window, and made him realise what a blinkered view of the world he had. "Where I came from, people who run grocery shops are usually thought of as those without dreams or ambitions. I probably wouldn't talk to one. But it made me realise how narrow my thinking was." This was reinforced by students from some of the top universities he met on his two exchanges. "I talked to one and asked him what he wanted to do when he graduated, and he said he wanted to open a bike shop," he says. Education, he decided, was just the means to an end. One should do what makes one happy, not what is expected by society or family. These and other experiences from his solo travels on the cheap around the region convinced him that he should not follow the same career route as most of his classmates: to be an IT professional in the banking industry. "Many of my classmates were getting offers from places like Barclays and Credit Suisse one year before they graduated. I didn't even apply," he says. Not that he knew what he wanted to do. The first gig he landed was with a Russian capital venture firm, and it was a royal disaster. He was supposed to do sales and his bosses called him day and night and pestered him to sell phones to the likes of the Land Transport Authority. They parted ways after just one month. At one stage, he had just 12 cents in his bank account and had to borrow money from his brother, also in Singapore on the same scholarship. He ended up at Lazada, an online portal for electronics backed by start-up incubator Rocket Internet. His job title was business development, and his salary, $1,500. "My friends were getting between $4,500 and $6,000 and going on holidays to Europe," he says. "I was doing their spreadsheets, copying stuff from PDF and pasting it into Excel or Google spreadsheets. I was doing it for every country." He found the job boring and frustrating. "It was frustrating because I had a lot of expectations. I thought I was a little bit smarter than just copy-pasting stuff." He persevered for a couple of months to learn the business but decided it was not for him. He landed next in another Rocket Internet-backed venture, Food Panda. "I went for the interview thinking that it was for PricePanda," he says, referring to the price comparison website. Fortunately, his smarts stood him in good stead and he bagged the operations manager job. Food Panda has received more than $100 million in funding since it started business in 2012. The food ordering system the company had then was very rudimentary. "I was supposed to come up with a better system, work on the orders as well as fulfil them and make the deliveries. And in the first two months, we didn't have a staff centre so I was the call centre as well." Thrown into such a deep end, many people would have drowned. "Sure, it was very intimidating but I told myself, 'Hey, I have a purpose. This is awesome, and I can do what I want.'" He set about researching how he could set up a system. "I was reading up about Internet phones and cloud systems," he says. Next, he started hiring people to man the calls. "I did call handling for a few weeks but I knew I had to get out of it and the only way to do it was to actively go out and hire people. If I didn't delegate my responsibilities, I would not be able to get other things started." The experience, he says with a chuckle, was surreal. "Six months earlier, I was trying to get myself hired. Suddenly I was interviewing people, some of whom were much older and a lot more experienced." He had no social life; he worked from 10am to 10pm. "But as Food Panda grew, so did I," he says. After setting up a system, he turned to marketing and branding. "When I first started, I knew nothing about SEM and SEO. Now, I'm invited to speak about these subjects at conferences," he says, referring to search engine marketing and search engine optimisation. "Now I have a very fair and valid opinion about a lot of things in this business because I had to do everything myself. I had to read books, I had to read reports, I had to learn all about expenses, I had to learn about everything, from zero." Asked to explain his success, Mr Malaviya says: "My approach was that I didn't want to do anything I didn't understand. What I was good at was numbers so my strategy for marketing - and I give myself a lot of credit for this - was simple. "If we are spending this amount of money, we need to ask ourselves two questions: what we will get out of it and if we would do it again." The first six months were extremely stressful but he thrived under the pressure. Food Panda grew by leaps and bounds. "When we first started, we had 20 food orders, mostly from our office," he says with a hearty laugh. "Nine months later, we were doing 200-over. Now it's a few thousand a day." The list of restaurants they represent also became a lot more impressive. "Now we have Pasta Mania, Sakae Sushi, Yoshinoya and Old Chang Kee. We have 350 restaurants; when we started, we only had 25." He became MD last August and Food Panda's Berlin headquarters started deploying him to help regional sales. That is how he ended up running the Hong Kong set-up, which he launched in May. "People who were sent there before me said it didn't make sense because there was too much competition. But I went in there, and I did it from zero. And now the operations in Hong Kong are bigger than all their competitors. Food Panda in Hong Kong has now become the eighth most profitable among our 40 countries," he says, adding that he spends alternate weeks in Singapore and Hong Kong. What he has achieved, he says, is validation for all the scepticism and naysaying that came his way, including from his parents. Without any affectation, he attributes his success to a keen sense of competitiveness and a big dose of guts. "It's about how you see yourself. I'm super competitive, I'm a winner and I want to be on top. I want more regions to run," he says. He readily admits there have been trade-offs. He still pulls long days, and works many weekends. And there's no time for a social life, let alone romance. It is all well and good, he says, to read about inspiring and successful people in the newspapers. "It's good to be inspired but if it doesn't convert into you doing something, then what's the point? I would like to be one of those stories people read in the newspapers."